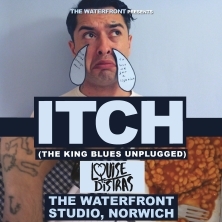 As frontman and songwriter for the critically acclaimed The King Blues for the past 13 years, Itch has made a name for himself as one of Britain’s most treasured lyricists and political spoken word artists. Through endless international tours, 5 albums plus a solo album and featured poetry performances, Itch has gained a sizeable fan base around the world. Page generated in 0,140778 seconds.